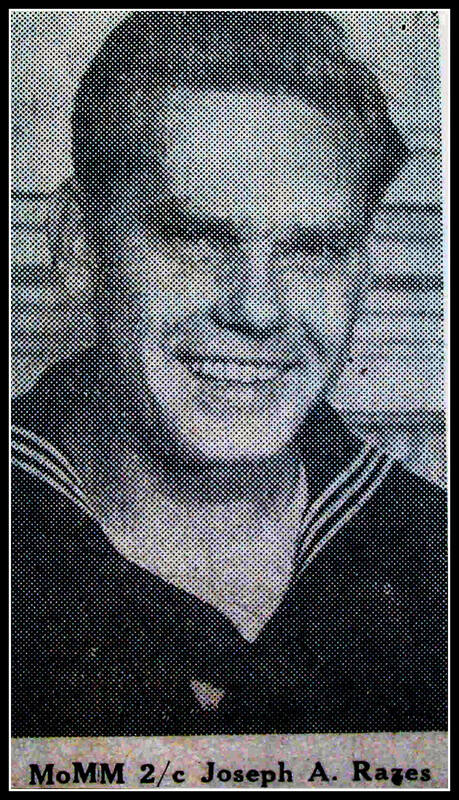 (June 29, 1944) -- Motor/Machinist's Mate 2/c Joseph Anthony Razes, 27, of Brighton Avenue, died of a ruptured aorta on June 2. He was buried in the South Pacific. Razes enlisted in the U. S. Navy on April 2, 1942. His service number is 02247949. MoMM Razes, who entered the service from Pennsylvania, is honored on the Honolulu Memorial, Honolulu, Hawaii. Razes had lived with his aunt and uncle, Mr. and Mrs. Edward Petrauskas, of Brighton Avenue, after his parents died in McAdoo, Pa., when he was a baby. He attended Montgomery and Silver Lake Schools.